Here's a superb new online slots game from Playson and try playing it. 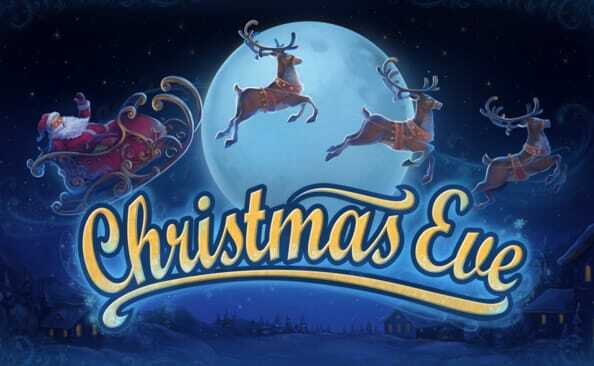 Christmas Eve is an online slots game by developer Playson. It is a festive themed slots game that definitely does bring the ‘Merry’ into Christmas. Much like Christmas Eve, this slots game keeps you excited in anticipation. It has features like Frozen Wild (Sticky Wild), and growing Multipliers. The bonus features present themselves to you much like wrapped gifts under the tree – teasing you and filling you with anticipation. Christmas Eve is an online slots games with 5 reels, 4 rows, and 1024 ways to win. The minimum bet is £0.20 and the maximum bet is £60. If you love promo's, get the top-rated slot bonuses today. Christmas Eve captures the magic of the festive season beautifully with a setting of a quaint village with a White Christmas. The symbols follow suit with Christmas decorations: Bells, Snow Domes, Candles, and Stars. There are also playing cards (10 to Ace) for the lower value symbols. This online slots game is not just a visual treat; it also has some serious wins hidden in its Christmas stockings. The game feature Wild and Frozen Wilds that appear and freeze in any slots on reels 2, 3, and 4. This function is similar to that of Sticky Wilds that you may have encountered in other slots games. The specials get even sweeter if you have consecutive wins. Every time you win you will be given a multiplier. The more you win consecutively, the higher the multiplier gets – the maximum is 5x, and it remains there until the end of the feature. The Wrapped Present represents the Wild Symbol in this online slots game. Like all other Wilds, the Wrapped Present can take the place of any symbol except for the Scatter (Santa Claus). Any winning combination that uses the Wild Symbol triggers the Frosty Wild Feature. If a Wild is used in a winning combination it becomes a Frosty Wild. This will not only give players 1 free re-spin, the Wild will be frozen in the same spot for the free spin. The Free Spins Round gets triggered when you land 3 or more Scatters (Santa Claus ). The number of Free Spins and Multipliers you receive corresponds to the number of Scatters you land. 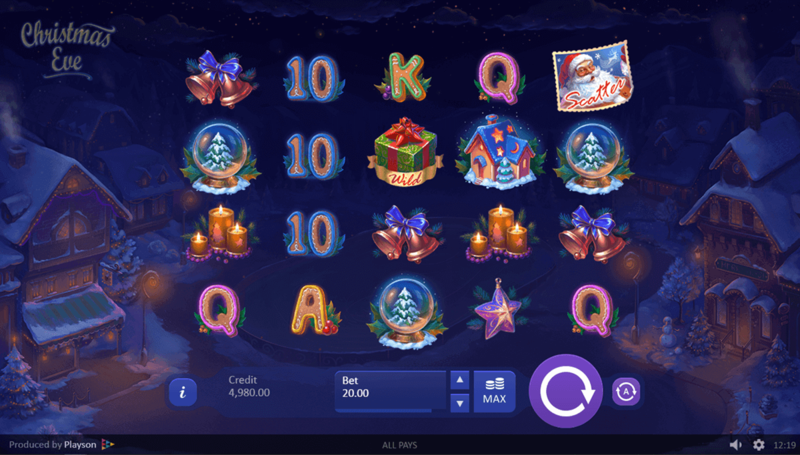 Christmas Eve is a neat little festive slots game that keeps you oh so merry. The game has pretty visuals to keep things nice and a good range of features to make things a little naughty. The Sticky Wild is a great addition, as is the cumulative Multiplier.